Learn the basics of bead weaving in this exciting new two-hour class! 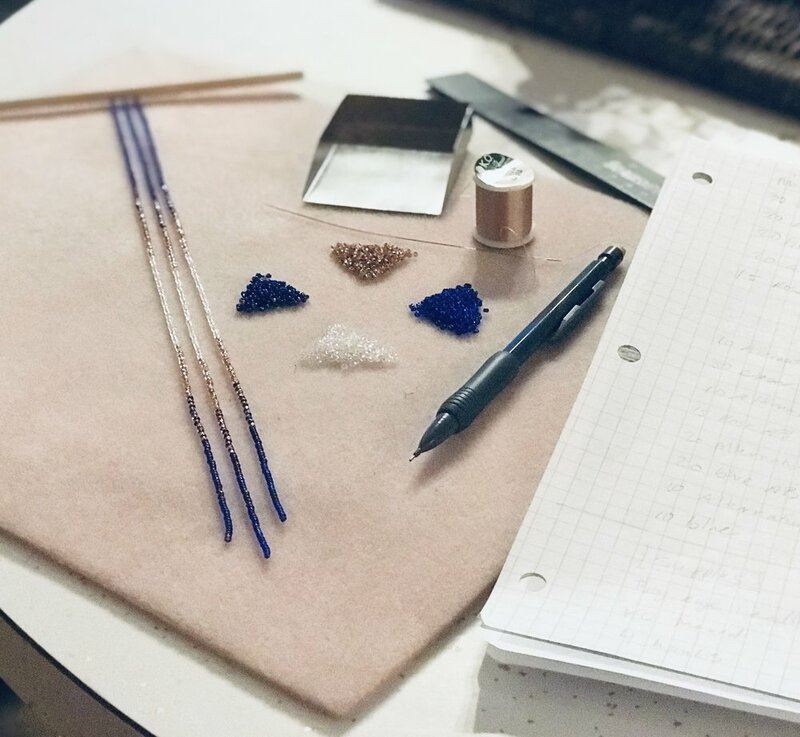 Students will learn even-stitch-peyote, which can be applied to all kinds of projects! Bead weaving is often compared to knitting, and uses a similar mode of thinking and skill set but with smaller scale and more precision. The perfect introduction to soldering using sterling silver. 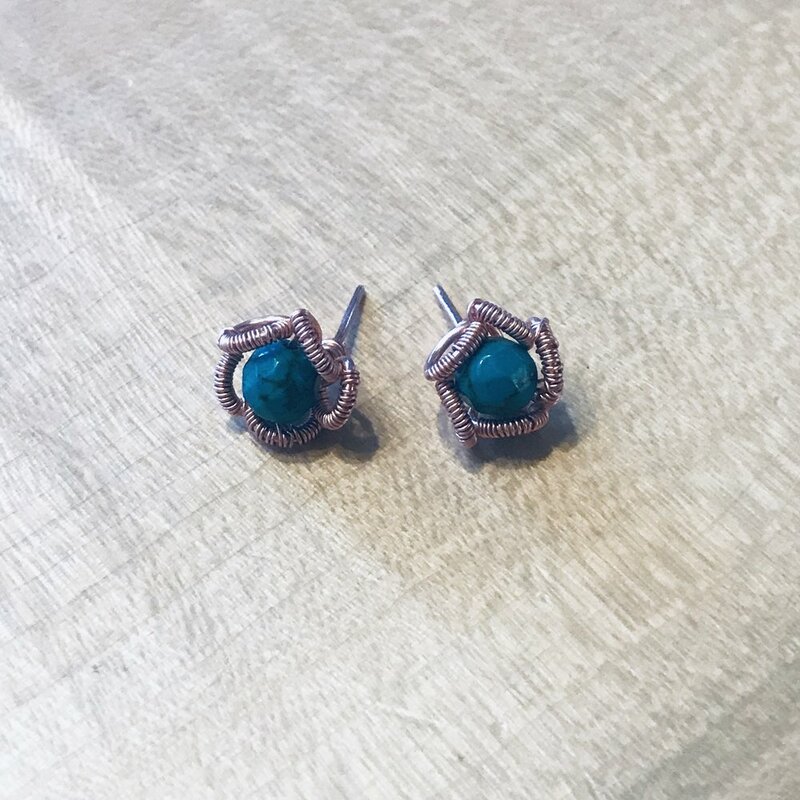 In this 3 hour class Students will learn how to draw a pattern in silver sheet metal, use a jewelers saw to cut out the design, file, and then solder an earring pin to create the perfect pair of post earrings! This class has three spaces available. *Students must register for this class 1.5wks prior to start date to make certain all supplies are available. Class is $75/person + $79 supplies kit please call 406-543-0018 to register or come by the shop to sign up. Payment is required upon registration. No refunds 48 hours prior to class. In this workshop students will make an Ombre effect multi-strand beaded fringe wall hanging using size 11/0 seed beads, Japanese nylon bead thread and a wood base. Once colors are chosen, students will be given a written pattern and then string beads in order to create this gorgeous ombre pattern one strand a time. 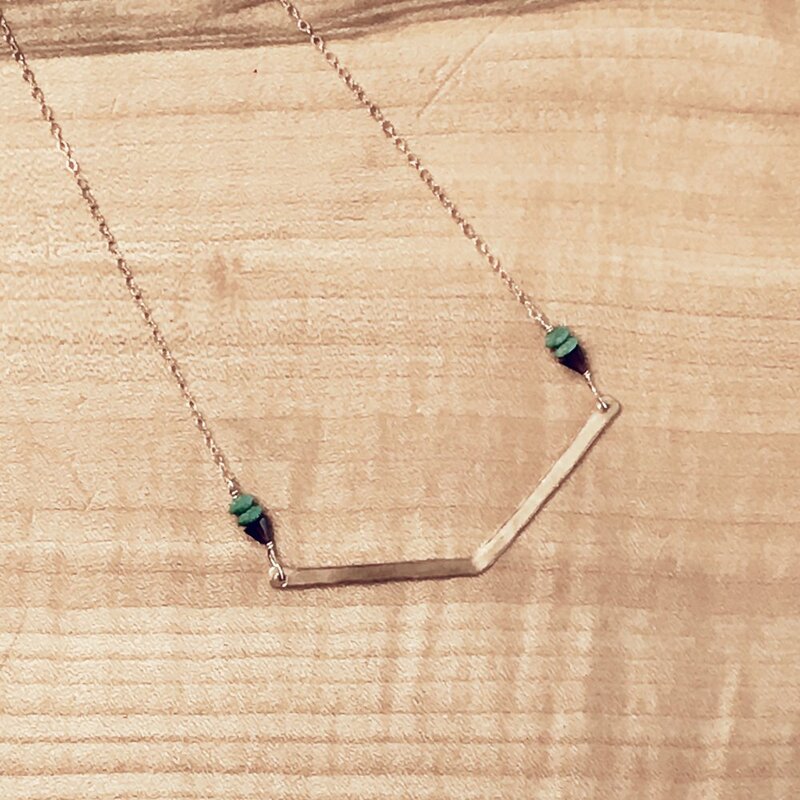 Hailey Michelson created Sun & Moonstone Co last year and has had a blast making jewelry ever since. She loves creating custom designs and creations. She enjoys playing with the old and the new, the rugged and the refined, the elegant and the eccentric. Stop by and say hi on her first ever First Friday show! Put a swing in your step with this new chandelier style earring… A new take on the Chevron Bar! Learn how to hammer wire, punch holes in metal, and wire wrap to chain. 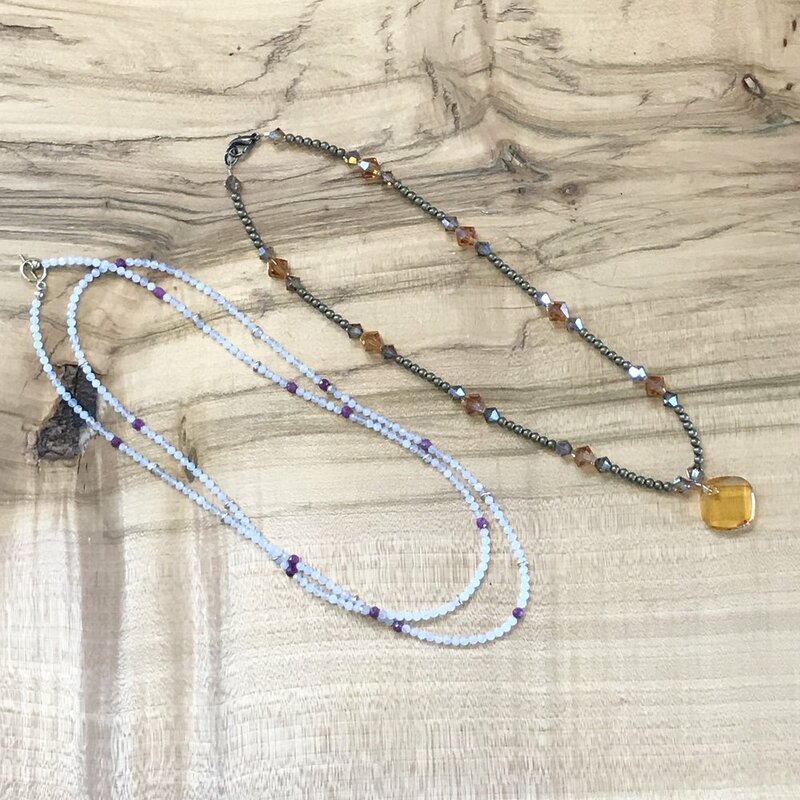 Add a dash of color with gemstones, mix & match your metal colors, and use some chain! Join us for this unique class where students will create a beautiful beaded sun catcher window hanging using a variety of beads, gemstones, and other materials. Be ready to refract some extra loving light into your home! *Tools will be provided. Registration is required 48 hours in advance. Please call or come by to register, 406-543-0018. Join us for April First Friday with Katelynn Greenberg. Arizona born, Montana living. I graduated from the University of Montana in Theater with an emphasis in Costume design. I have always been inspired by nature, but the mountains have claimed my creativity. I am self-taught in jewelry rigging but am constantly trying new techniques. My brand is called HardcoreGentleness. This came to be because of some lyrics written by J Dilla. These words are significant because they translate into what I feel with my design aesthetic, a juxtaposition between hard and soft. There is a bit of Southwestern flavor mixed with the natural Montana feel. I like to mix metals, and pair unlikely colors and shapes together. I imagine the earrings I make speak to the person’s style wearing them. A person who is both badass and delicate. Every pair is expressed with Meraki, the Greek word that means the soul, creativity, or love put into something; the essence of yourself that is put into your work. Not just for your grandmother’s old pearls! 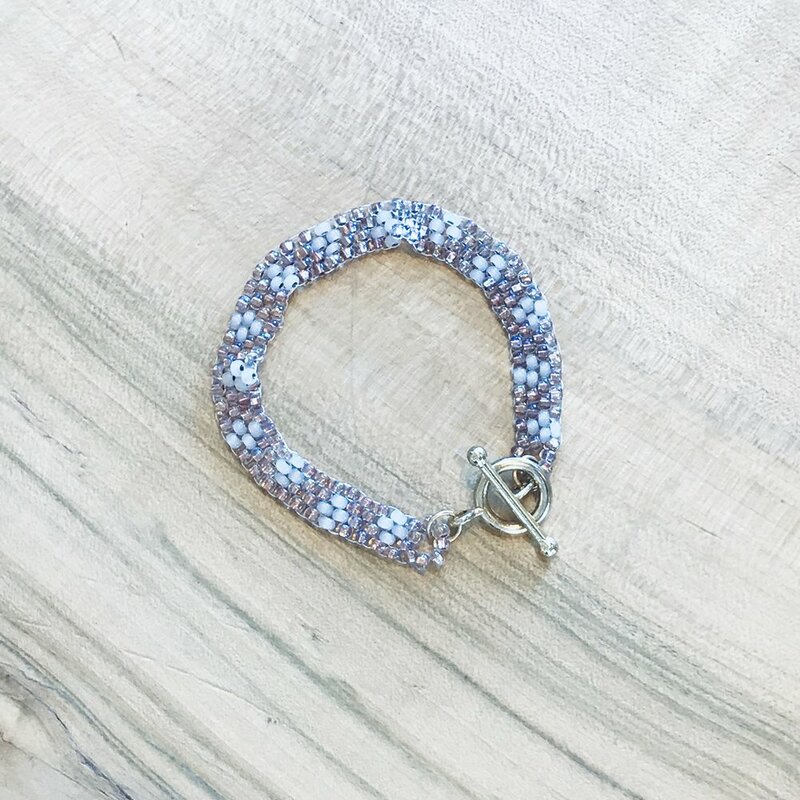 Master the skill of precise bead knotting using beads of your choice, tweezers, or a knotting awl. Join us for this unique class where students will create a beautiful beaded sun catcher window hanging using a variety of beads, gemstones, and other materials. Be ready to refract some extra loving light into your home! Cassie Taylor is a 4th generation bench jeweler specializing in hand fabrication and lost wax casting. Her designs are typically minimalistic and easy to wear, with clean lines. All designs are made in her small Missoula studio. Adorn your favorite makers space with all the succulents and air plants you need to get that blissful state of creativity rolling. On Saturday, February 9th Leah Morrow from Object 57 will be set up and ready to sell you the sweetest plants to help you create a more blissful space in your life. Leah combines her love of vintage and plants to create the perfect gift to yourself or the loves in your life. As each plant is lovingly placed in a vintage vessel! She will be selling succulents, air plants, and house plants. Bathing Beauties Beads Annual February Sale! Join us Thursday, Feb 7th through Monday, February 11th for our biggest sale of the year! 50% off most strands and loose beads! 25% off beading supplies, tools, findings & More! For more information please call us at 406-543-0018 or come on by the shop. Join us for our First Friday in February! Two fabulous designers Corkey and Jo will be here selling their one-of-a-kind beaded gemstone pieces and taking custom orders! Corkey Herron and C Joanne Winter custom design one of a kind jewelry using semi-precious stones of Carnelian, Jasper, Tigers Eye, Lapis, Fresh Water Pearls, and Crystals, to name a few. Inspired by nature, you will certainly see that concept reflected in many of their designs. And of course we will be serving up some yummy treats! 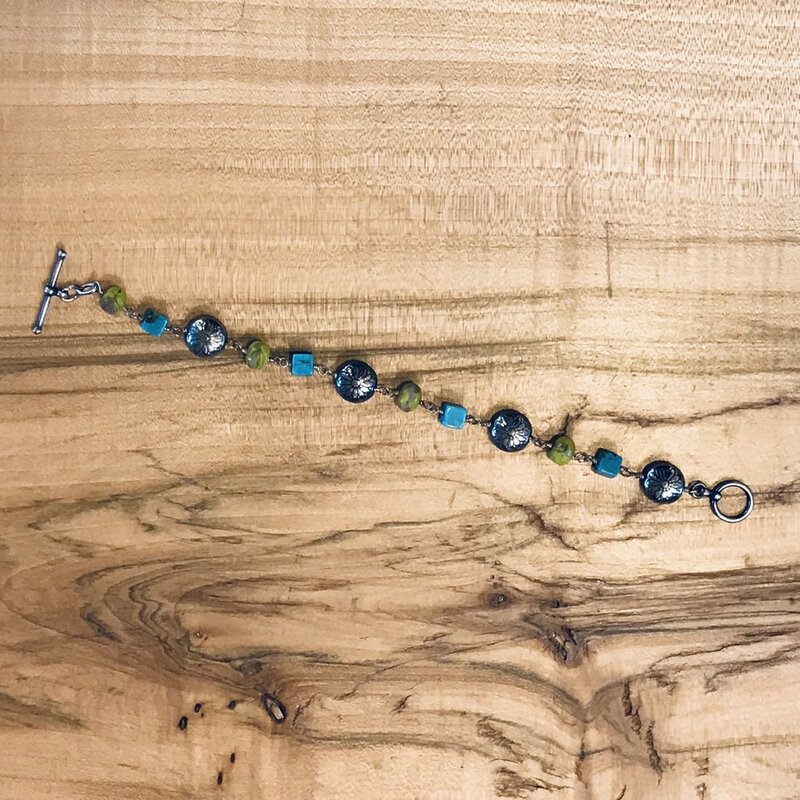 During this class students will have the opportunity to create round wire links in graduated sizes, texture, and wire wrap into a pendant for a necklace. The perfect intro to using a mandrel, bench block, and chasing hammer! Come on in anytime between 2pm & 4:30 this day to create and design jewelry to be sold Friday, December 7th at our 4th annual fundraiser to benefit the Missoula Food Bank. Designing will go until 5pm this day but be sure to get here by 4:30pm so there is still plenty of time to create! We have TONS of free bead packets for you to use! You will need to pick out and purchase any wire/findings/supplies needed to complete your design. For questions or to sign up please give us a call at 406-543-0018. YAY! It’s that time of year again when we get to make snowflakes with you Missoula! Join us for this fun family activity! Beaded snowflakes can be ornaments, window hangings, wall decor, you name it! The perfect gift to make for all those special folks in your lives. $5/snowflake all supplies included and we help you make it right here!